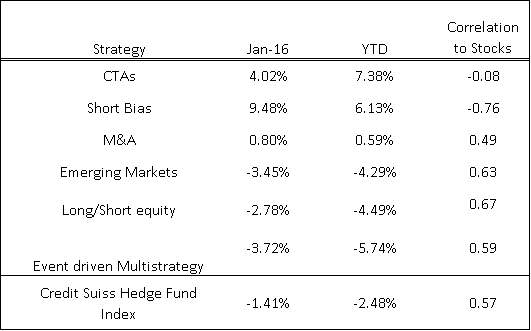 However, some of the strategies included in the Hedge Fund Universe have managed a positive performance since the start of the year; namely Short Bias and CTAs. On the other hand, the difference in size of assets under management has counted for large differences in performance. The larger funds being the ones with the highest negative performances, they have also suffered the largest rates of withdrawals. The table above shows Net performance and growth in AUM for hedge funds worldwide registered with Eurekahedge by size of fund. You can see that the worst performing category with a YTD of -7.1% is the $1 billion or larger fund size. The best performing fund size was less than or equal to $20 million with a YTD of -0.3%. We can also see that the largest outflows of capital occurred with some of the largest funds; funds with AUM above $1 billion that lost 1.09% and funds between $100 – $250 million lost 1.14% of assets so far in 2016. The cause of the poor performance for the largest funds may be due to the prevalence of certain strategies they tend to adopt. Some markets, like futures, have a relatively small capitalization, meaning that multi-billion dollar funds will see their strategy reach capacity well before all funds are invested. This fact limits somewhat the choice the very largest funds have in choosing which strategy to adopt. Not all hope is lost; some strategies have performed incredibly well as mentioned earlier. The best performing strategy YTD so far has been Managed Futures funds or CTAs. This strategy is highly uncorrelated to the stock and bond market and, therefore, can give positive returns independently of how those markets perform. The CTA index had a return of 4.02% in January alone and is up for the year by 7.38%. A lot of this performance may be due to the sustained rallies in some commodities, in particular, Gold and Crude Oil. CTAs usually do well in trending markets, and that is what they have seen since the beginning of the year. Due to the volatility and downside price action from the start of the year, Short Bias has performed well on a YTD basis. This strategy returned 9.48% for January and despite the recent stock market recovery, is still returning a more than reasonable 6.13% YTD. For this strategy, a lot depends, of course, on how sustained the recent rise in stocks may be. Given the various negative reports and concerns for interest rate increases as well as a global slowdown, this strategy may still be worth having in a well-diversified portfolio in an attempt to protect the downside. M&A strategy funds have also done well from the start of the year, the index for this strategy returned 0.80% in January and 0.59% YTD. This strategy will usually not perform too well if there is a full market rout. In that case M&As usually dry up and deals to target become few and far between, depressing returns from these funds. However, volatile or subdued markets alone may not necessarily be detrimental for this strategy if the stock market manages to maintain at a steady level. The strategies that have performed the worst so far this year are; Emerging Markets, Long/Short Equity and Event Driven Multi-strategy. Event driven takes the top spot for worst performer with a YTD of -5.74%. This doesn’t surprise as funds following this strategy may also engage in trading distressed debt or below investment grade credit which are more likely to perform badly in a declining stock market. Long/Short strategy doesn’t particularly surprise with a negative performance of -4.49% YTD as this strategy has a high correlation with the broad stock market. One strategy that does surprise for its negative performance so far this year is Emerging Markets. EM index has had a -4.29% return since the start of the year. While most of the major commodities have made a recovery from recent lows with Crude Oil leading the way, you would think this strategy may have benefitted. The increase in commodity prices should have given many corporates operating in extraction and mining a big boost allowing hedge funds to take advantage for better performance. It is still quite early in the year yet to be drawing conclusions on the overall performance of this asset class. Hedge Funds may still perform well this year, and it would seem that certain strategies may perform better than others due to low correlation or even negative correlation to the general stock market. Ultimately, I think it takes a well-diversified portfolio with exposure to different risks to gain advantage from a varied source of returns. This should allow for a more balance performance and reduce negative returns in times of stock market bears.